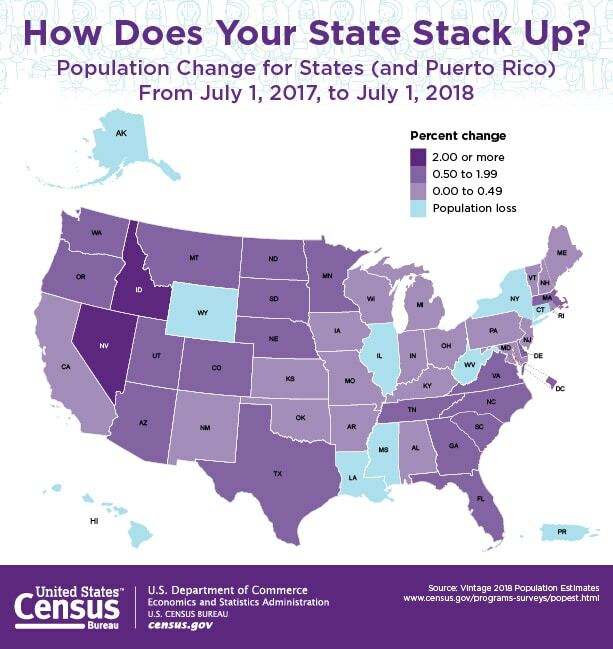 Last week the U.S. Census Bureau released its national and state population estimates with the headline, “Nevada and Idaho Are the Nation’s Fastest-Growing States”. As a whole, the U.S. population grew by 0.6 percent between July 1, 2017, and July 1, 2018. However, Nevada’s population grew 2.1 percent during the same time period. That’s 3½ times the rate of the nation’s growth. 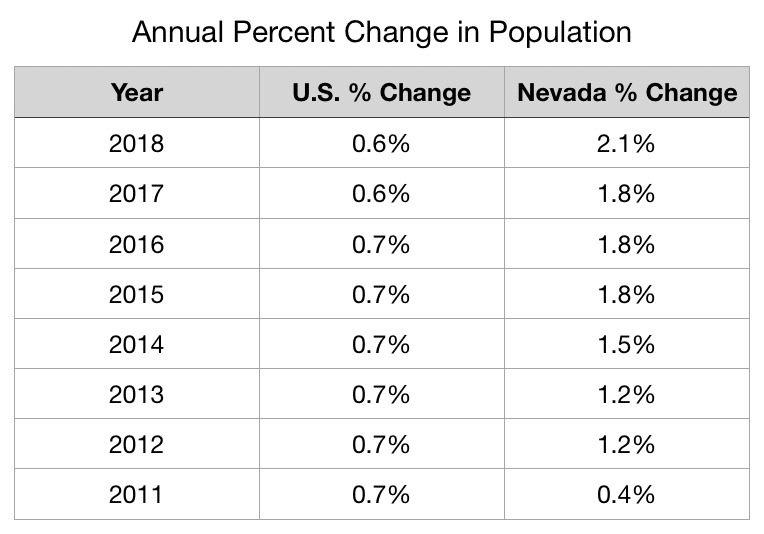 Not only was Nevada’s population percentage growth the highest in the country, but also its numeric growth placed it in the top-ten states in the country. As can be seen from the table above, Nevada’s population increased by about 62,000 between July 1, 2017, and July 1, 2018. But where did this growth come from and where did these people settle? To answer these questions I dug a little deeper. There are two types of increases in population: natural increase (the excess of births over deaths) and net positive migration (inbound migration minus outbound migration). Fortunately, the U.S. Census Bureau has data on all of this, and much more on their American FactFinder site. Using the American FactFinder site I accessed the most recent data set available, which was for 2017. Using the 2017 data set I learned that, from July 1, 2016 to July 1, 2017, Nevada’s population increased by 58,785. 12,420 (or 21 percent) of that increase was due to natural increase and 46,184 (or 79 percent) was the total net migration (both domestically and internationally). As can be seen in the table above Total Net Migration to the state of Nevada was 46,184 — with Domestic Migration accounting for 38,227 (or 79 percent), and International Migration accounting for 7,957 (or 21 percent). Net migration is the difference between those residents leaving the state and the new ones moving to the state. To find those two components I explored deeper into the Census Bureau’s website and discovered State-to-State Migration Flows tables. These massive tables contain the yearly inflows of people to a particular state arriving from every other state in the U.S. and also the District of Columbia and Puerto Rico. Additionally one can see the destination states to where those leaving a particular state are moving to. The tables are broken out by year. 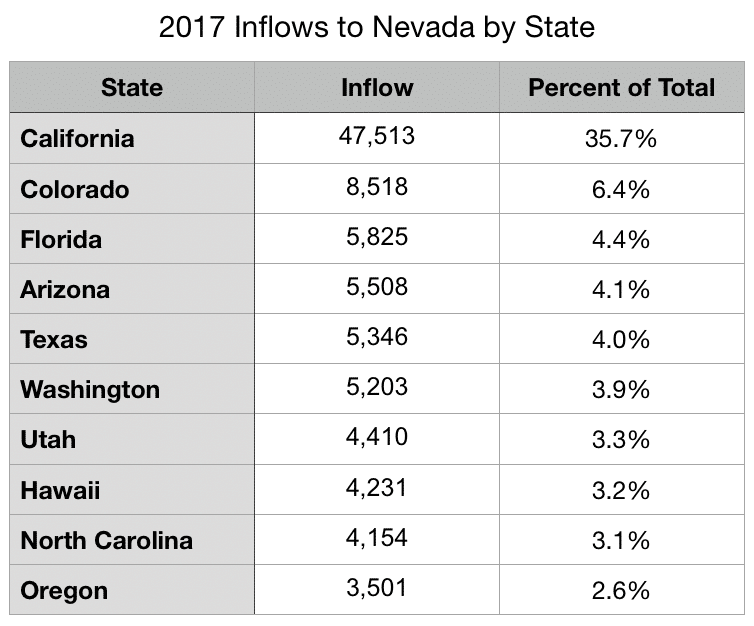 Using the six most recents years of data from these tables I compiled the following domestic inflows and outflows for Nevada. Looking deeper at the data in these tables one can see the breakout of the inflows and outflows by state. In the table below I’ve listed the top ten states contributing the greatest number of new residents to Nevada in 2017. Clearly, California is responsible for the greatest proportion of new Nevada residents — contributing 47,513 people to our state. In 2017 nearly 36 percent of people relocating to Nevada moved here from California. Colorado was 2nd — contributing 6.4% of those moving to Nevada. While more than 133,000 people moved to Nevada in 2017, over 98,000 left the state. The same State-to-State Migration Flows tables can be used to see where those people went. In the table below I’ve listed the top-ten states receiving the greatest number of former Nevada in residents in 2017. Again we see California topping the list — receiving nearly a quarter of everyone who moved out of Nevada. In 2017 23,768 people left Nevada for California, but as noted previously, California contributed 47,513 people to our state during the same year. 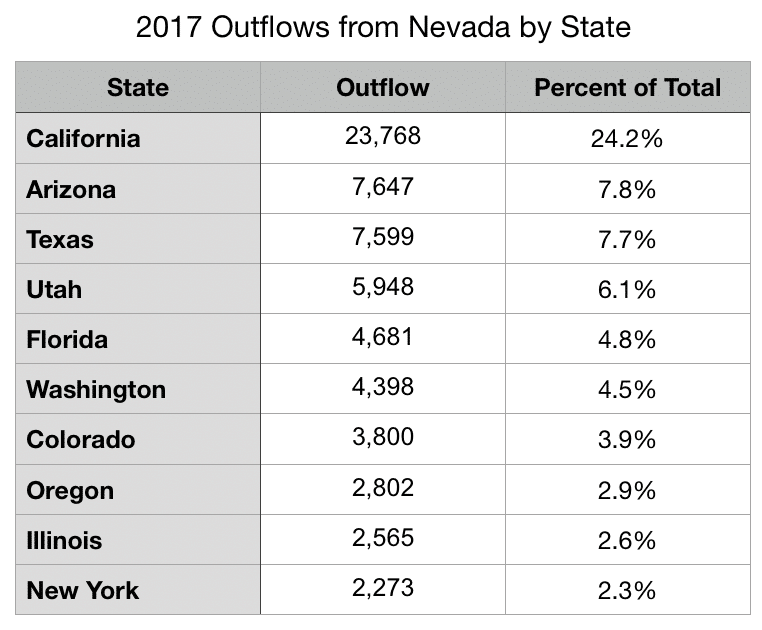 Nevada’s inflow of Californians is double its outflows to California. In other words, for every Nevadan that leaves for California, two California residents relocate to Nevada. Did you know that much of the U.S. Census data is broken out to the county level? There are over 3,100 counties and county-equivalents in the 50 states and District of Columbia, and the U.S. Census Bureau has data on all of them. If you’re a numbers person or data geek, I recommend you check out this cool interactive tool. Be warned though, you may find yourself going down a rabbit hole. 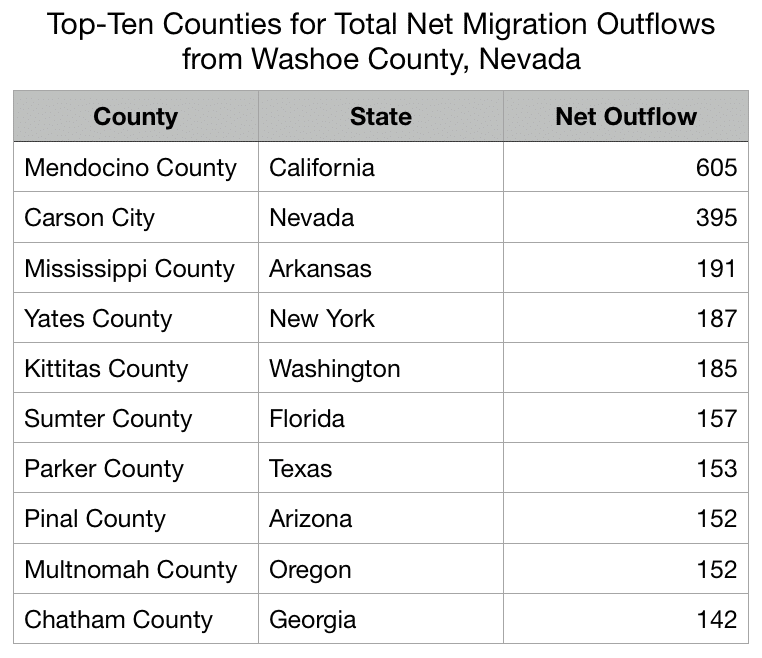 Let’s take a look at the total net migration flows for Washoe County, Nevada — the county in which Reno and Sparks are located. The chart below shows a U.S. map with every county in every state outlined. 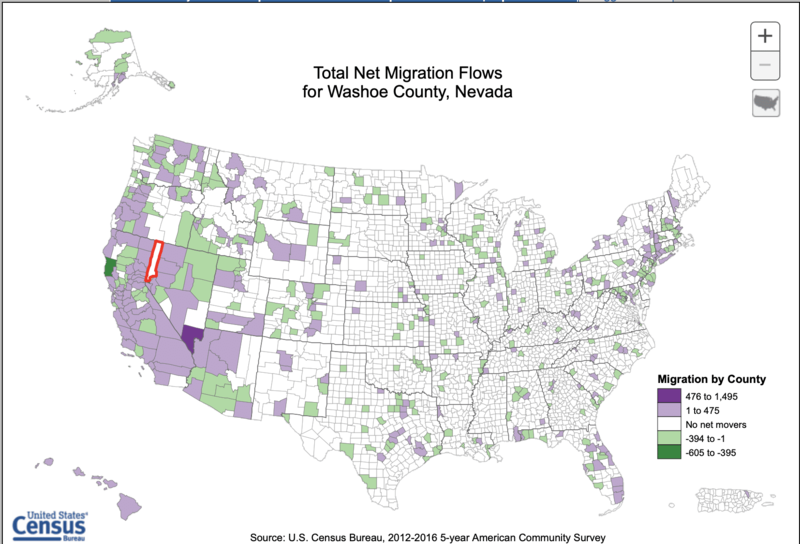 By clicking on a county, in this case Washoe County, that county is outlined in red, and then every other county in the country is color coded according to the net number of people migrating to or from Washoe County. 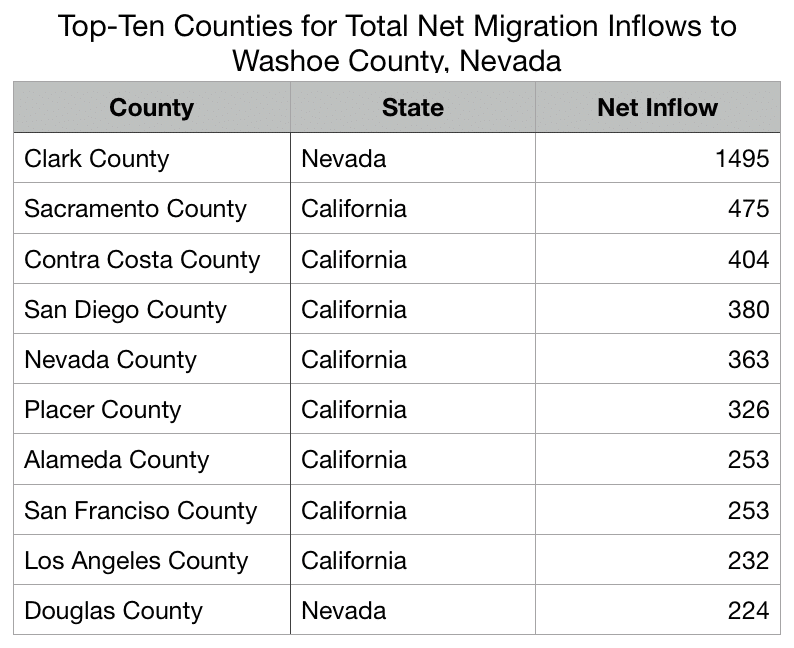 In the table below I’ve listed the top ten counties contributing the greatest number (net) of new residents to Nevada from 2012-2016 (this is the most recent data set available). Not surprisingly, given the state rankings above, most of the counties responsible for the greatest net inflows are located in California. That being said, Clark County, Nevada, home of Las Vegas, tops the list. Clark County is Nevada’s most populous county, and accounts for nearly three-quarters of the state’s residents. In the table below I’ve listed the top-ten counties receiving the greatest number (net) of Washoe County, Nevada residents from 2012-2016. We often hear the terms “rich Californians” or “California money” when discussing the inflows of Californians to our market. 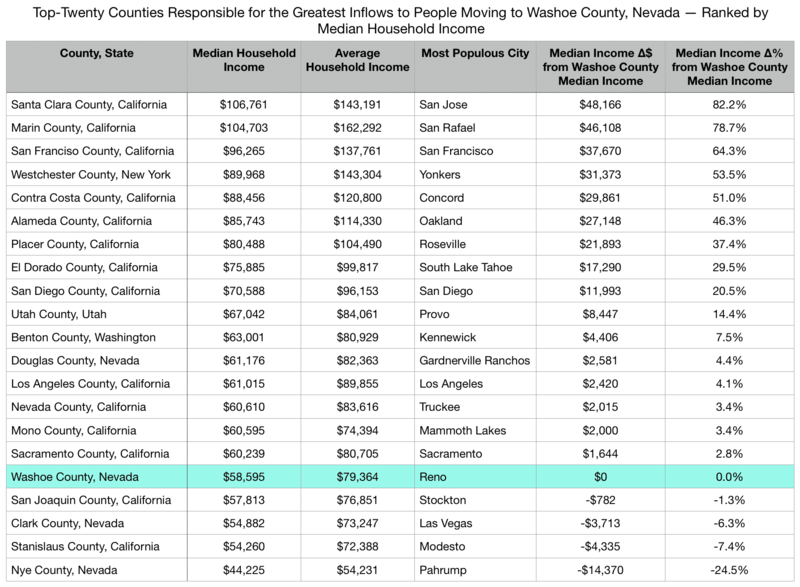 Though there’s not a way to calculate the amount of money moving in from California, I am able to compare the median household incomes of the areas from which people are moving to that of Washoe County. Thank you for reading. I would love to see your comments and thoughts below. Also, let me know if you have specific questions regarding the above. This entry was posted in Agent Insights and tagged Nevada migration, population, washoe county migration, washoe county population. Bookmark the permalink. Mississippi County is actually in Arkansas, but still puzzled why 191 people from Washoe County moved there?? Thinking military migration might be a factor. Good catch, Geoffrey! Thank you for bringing it to my attention. I have made the correction. Thank you again and thank you for reading the blog! Whew, those state to state migration tables are something else. I may write something to scrape them just to save my eyes. I think it is time to start cashing in on those “We don’t care how you do it in California” bumper stickers. One figure was not right in this line: “As can be seen in the table above Total Net Migration to the state of Nevada was 48,184”. Should be – 46,184. Thanks for the analysis, and especially highlighting the tools and data sources you found while generating this content! Thank you for your comments, Vale. LOL at the bumper sticker comment. And thank you for the correction! Much appreciated.